Martin and Rachel help Kyle consume the monstrous mushrooms known only as “Matango”… what could possibly go wrong? Happy Thanksgiving, my fellow kaiju-philes! 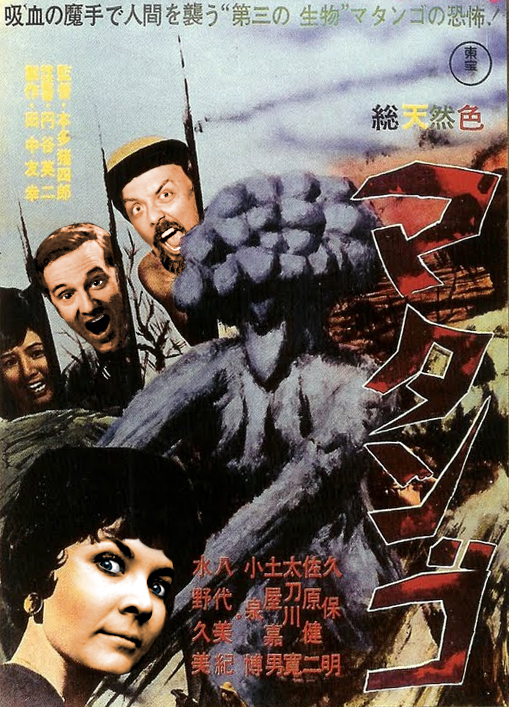 Let us give thanks for fungi this month because we are talking about the terrifying toadstools known as Matango – or, if you happened to catch it back when it was released through AIP on television, Attack of the Mushroom People (1965)! This film is a lot less like our standard giant monster fare, but the reason it’s still in the list of films is that Kaiju actually means “strange beast” and that description of the Mushroom people is apt. If you haven’t seen this film, I highly suggest it – if only because of the phenomenal acting and the tension that the tale builds. In fact, while most of the Godzilla, Gamera, etc. films are pretty much science fiction films, Matango definitely sits in the horror camp. Any time I see Godzilla films lumped in with other scary movies, my reaction is usually “Pfft…. I guess the first one…” But Matango is definitely a scary film from the 1960s and is based on a short story written in 1907 by author William Hope Hodgson called A Voice In The Night. You can read the whole thing online here – it’s definitely worth a read! This episode also marked the first time I’ve ever gotten more music requests than I typically play, so I was quite happy to play them all (seriously…keep them coming), but I spread them throughout the podcast instead of just having one massive music block. Let me know if you like that better (I’m sort of leaning towards that technique for the next year). 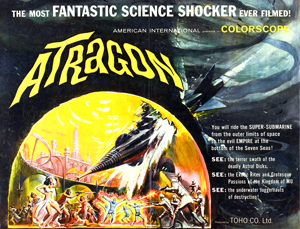 December’s discussion will revolve around another fantastic film celebrating its 50th anniversary this year – one of my favorite tokusatsu entries of all time, Atragon (1963)! We’ll definitely be watching the Tokyo Shock/Media Blasters version (and unfortunately the DVD doesn’t appear to be in stock anywhere that won’t demand an outrageous amount of money). Normally I don’t ever suggest finding a bootleg, but jackholes that artifically inflate the prices of these movies really get me angry. I won’t link to them, but if you look for a place that sells TOYS from MONSTER ISLAND, you can find the DVD on their website. Ugh, anyways, that’s neither here nor there. If you’d like to submit your thoughts, questions and reviews of Kaitei Gunkan, you have until December 23rd to send in your “homework”. Good luck finding the movie if you don’t have it already.